He suddenly woke up. Or he thought he did. And walked slowly towards the anteroom. Or he thought he did. He was expecting to find his keyboard player, his familiar anteroom. But soon he realized his walk was on a sound, an immaterial layer composed by a subtle web of notes. All of a sudden, he realized he lost his weight and was able to walk on music, to go far, to explore new frontiers, to leave into a new dimension. ‘How essential is to fluctuate on a G tonality’ he thought, feeling himself lighter, vanishing, translucent. And soon the Variation 10, a Fughetta for four voices, exploded in the anteroom, and took the shape of four different lights, chasing each other, and describing beautiful shapes in the air. And the room was no longer his anteroom, but a space surrounded by notes and music and rhythm. Without floor. Notes, everywhere. All of a sudden, he realized he was outside, under an infinite sky, at dusk. Little by little millions of stars appeared, and then galaxies and planets. A never-ending materialization of remote worlds. The sky was fluctuating in waves, stars were moving around like driven by a giant hand, caressing them. And out of this wave the Queen of the Night appeared in the distance, making the music louder, and the universe shaken by a giant “vibrato”. 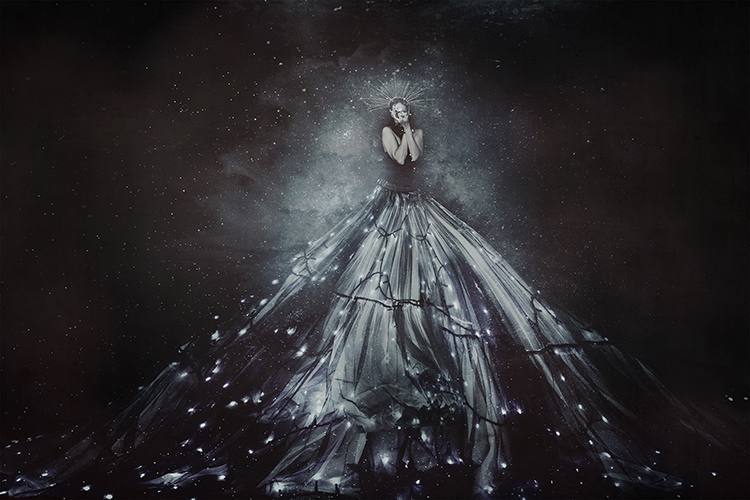 The Queen was holding newborn stars in her hands while other stars were rolling on her dress, ready to join their own galaxies. 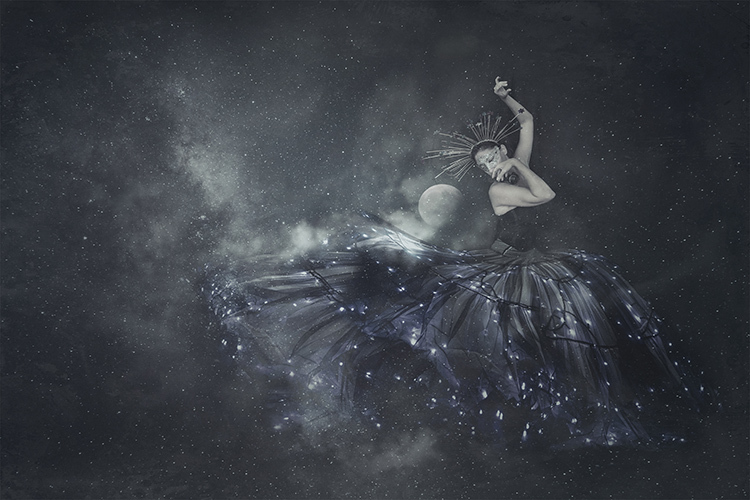 Her dance was the core source of movement of the universe and her dress the starting of the orbits of the new stars, their path to spread into new worlds out there. The Queen of Night was immersed in this magnificent universe of notes, transforming them into colors, lights, shadows and additional sounds. Harmonics were caressing the translucent body of the Count, who was listening to this music, four and four and four and four to the infinite voices, disappearing in the universe. In this wavy sky, a full moon was now the only fixed point, the only and last reference to the Count’s concept of time. 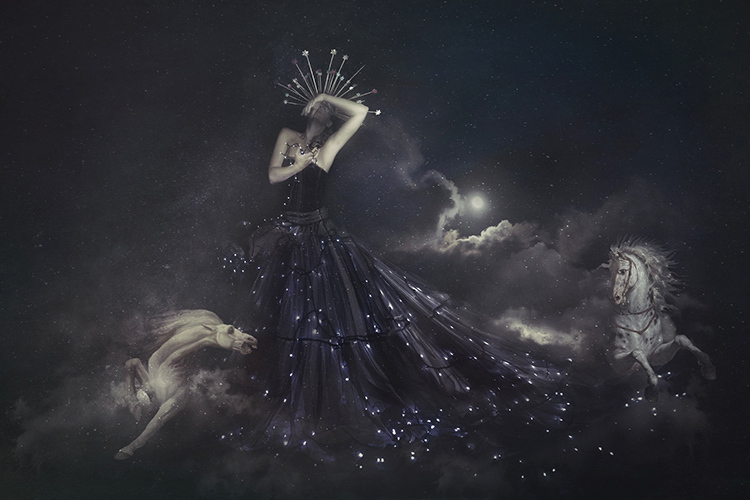 When the night was at its darkest moment, white mares with bloodshot eyes and ears appeared around the Queen of the Night. Their manes fluctuating in the sky were collecting the residual stardust and transforming that in the most frightening dreams. The mares were running galloping in the sky, all around the Queen. Their clogs shining like half-moons; their movement in the sky making sinister and frightening sounds. Clouds, music, dances, dust, energy. In front of the Count, the magnificent process of making nightmares in the darkest night. He remained still, fluctuating.